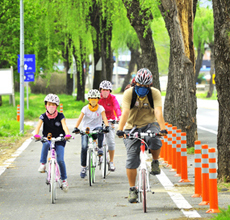 The newly-constructed bicycle route that runs along Korea’s four major rivers— Hangang River, Nakdonggang River, Geumgang River, Yeongsangang River— stretches 1,757 kilometers across the country and takes riders past traditional Korean villages, historical relics, and restaurants with traditional Korean food. Connecting the land from east to west, and from north to south, the route was recently constructed, and is safe for cycling. It also features a variety of convenience facilities including camp sites. The route also features several bicycle rental shops on the way, so visitors can rent a bike and safety gear at affordable prices. 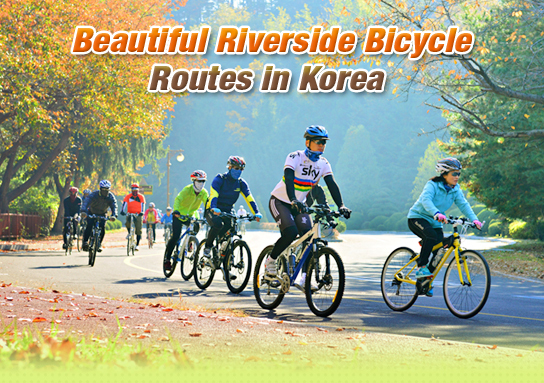 Read on and immerse yourself in the scenic adventures of cycling tours around Korea. 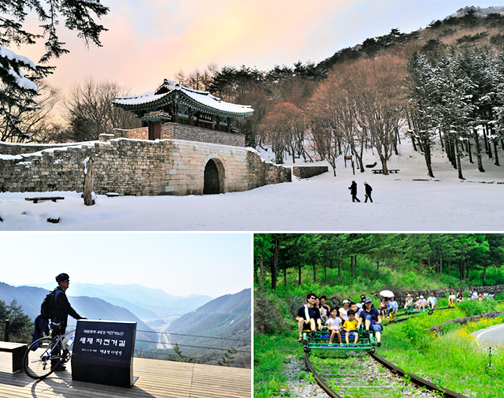 Crossing the infamously rough Ihwaryeong Pass of the Baekdudaegan Mountain Range (extending about 1,470 kilometers from Byeongsabong Peak in Baekdusan Mountain to Cheonwangbong Peak in Jirisan Mountain), the Saejae Bicycle Route requires great physical strength and endurance. This is the only route between Namhangang River and Nakdonggang River that goes over a ridge. It begins from Chungju Tangeumdae Terrace & Park and goes through downtown Chungju before climbing to a higher elevation towards Ihwaryeong. The meandering and rising ridge is rough and steep, and in ancient times, travelers had to face tigers and other wild animals. So, it is said that people used to cross the ridge in groups. 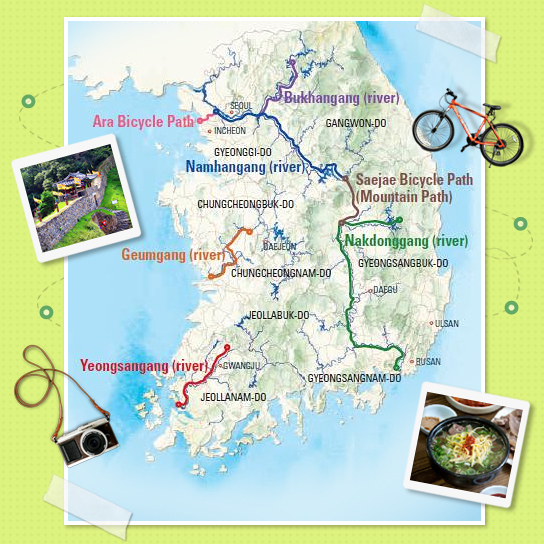 Past Ihwaryeong, the Saejae bicycle route goes through Mungyeong and joins the Nakdonggang bicycle route at Sangpunggyo Bridge in Sangju. Suanbo in Chungju is the nation’s largest hot spring area. Emanating from a depth between 250 meters and 700 meters underground and reaching 53 degrees Celsius in temperature, the water does not need to be heated or cooled down. The water contains many health benefiting minerals, so it is effective for rejuvenating the skin. The Suanbo Hotel and Resort features an open-air hot spring and a fitness center among its facilities. Situated 866 meters above sea level, Mungyeong Flying Land is the nation’s first paragliding runway. Visitors can take part in a tandem flying program with an instructor to get a birds-eye view of the area. The Mungyeong Zip Line, situated in Buljeongsan Mountain Recreational Forest, offers a thrilling ride down a ridge and valley. The Mungyeong Rail Bike sits upon the tracks of a railway that was used 20 years ago for the transportation of coal. The rail bike passes by a black hole-like tunnel, on a bridge over a river, and through a rural area full of blossoms of wild flowers. Two courses are offered: one to Buljeong Station and the other to Gaeun Station. In Suanbo in Chungju, there are a few restaurants specializing in pheasant dishes. They offer raw pheasant meat (with pheasant sashimi), pheasant bulgogi, pheasant meat dumplings, and pheasant meat sujebi (dough flake soup). Pheasant meat has a plain taste and it is lean. In the past, it was presented to the king. Also a regional specialty of Chungu is the Sanchae Jeongsik prix-fixe, which comes with 20 or so wild vegetables. The grilled yakdol pork of Mungyeong is made with the meat of pig that was fed with stone powder containing germanium and selenium. The characteristic of the meat is that it is chewy and does not have the unique pork meat smell. There are many restaurants specializing in yakdol pork near the entrance to Jeomchon Station or Mungyeongsaejae tourist site. The thematic pension train in Buljeong Station is made out of an abandoned train. It offers a kitchenette and bed, as well as air conditioning, a heating system and television. By the entrance to Mungyeongsaejae, there are many unique accommodation facilities, including the Saejae Smurf Village (a village of pensions made of yellow earth) and the European-style STX Resort.